Raising Real Men » » Celebrate Presidents Day with a Free Download! 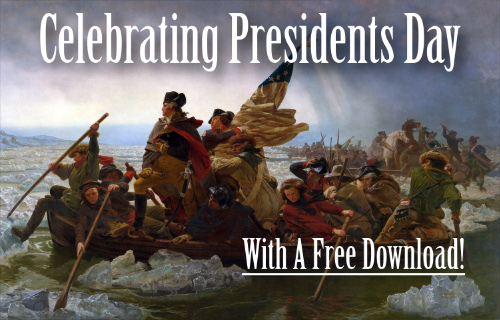 Here’s a neat resource you can download for free and share with your sons in honor of Presidents Day — examples from the lives of great men who have led our country! For Presidents Day, why not take a new look at the lives of our presidents? John Quincy Adams and the Right of Petition is a remarkable story of a true public servant, unashamed to return to Washington as a congressman after being president, whose quiet persistence on a point of order kept up pressure against the permanent acceptance of slavery. Ulysses S. Grant at Vicksburg illustrates how a soldier who barely graduated West Point and failed at nearly every business he tried, developed the determination and focus to overcome all kinds of obstacles–and ultimately bring the Civil War to an end. you can hear the rest of them in our audiobook series, Hero Tales from American History! This set of five cds (or mp3 downloads!) will take you from the colonial era to the Civil War, and include music from the time and authentic sound effects (including historic machinery, period weapons, and actual Confederate soldiers) to make Roosevelt and Lodge even more entertaining! or go ahead and order the whole series below!